The Hill-Sachs defect is a compression fracture of the humeral head associated with instability. At the time of shoulder dislocation, the soft cancellous bone of the humeral head is impressed against the hard cortical bone of the anterior glenoid rim, creating a compression fracture in the humeral head. This can be visualized on an internal rotation radiograph of the shoulder, as first described by Hill and Sachs in 1940 . The incidence of the defect approaches 100% in patients with recurrent anterior shoulder instability. Larger lesions with advanced bone loss are more likely to engage, resulting in shoulder instability at lower arm abduction angles. In patients with moderate bone loss, the defect may be managed by arthroscopically filling in the defect with the infraspinatus tendon or with allograft corticocancellous plugs. The true incidence of Hill-Sachs lesions is unknown. While reported to occur in 40% to 90% of patients with an initial dislocation event [2-5], the incidence may be as high as 100% with recurrent instability . The size of the defect is often related to the amount of time the shoulder remains dislocated, thus quite small with the first dislocation. With each subsequent dislocation, the compression fracture enlarges, becoming more evident on follow-up radiographs. A growing body of evidence in the orthopaedic literature supports the notion that recurrent instability of the shoulder leads to progressive bone loss, both on the glenoid and the humeral head. Bone loss on either side of the joint may lead to recurrent instability at lower arm abduction angles, as well as feelings of instability with activities of daily living. Shoulder dislocations can occur with less force, such as while sleeping at night or with the arm adducted at the side. A substantial amount of literature describes the well-established relationship between anterior glenoid bone loss and recurrent instability [6-9]. However, there is little published data on management of bone defects on the humeral side . Reverse Hill-Sachs lesions are located on the anterior-superior humeral head, and they are associated with posterior shoulder dislocations. The incidence of this type of lesion is difficult to quantify, as posterior dislocations are much less common, although the reverse lesion may occur in up to 86% of posterior instability cases . Hill-Sachs lesions most commonly occur during anterior glenohumeral instability episodes. The shoulder typically is in an abducted, externally rotated position. As the humeral head is forced anteriorly, the capsule, glenohumeral ligaments, and glenoid labrum are stretched and likely torn. As the humeral head translates farther anteriorly, a compression fracture occurs along the posterior-superior-lateral aspect of the humeral head as it comes into contact with the anterior glenoid rim. In cases of recurrent anterior shoulder instability, the static restraints to glenohumeral translation (capsuloligamentous structures and labrum) become increasingly attenuated. This makes it easier for the relatively softer cancellous bone of the humeral head to sustain continued damage as it makes repeated contact with the harder cortical bone of the anterior glenoid rim . An engaging Hill-Sachs lesion, as described by Palmer and Widen  and Burkhart and De Beer , occurs when the humeral head defect engages the rim of the glenoid while the shoulder is in a position of athletic function, with 90° of abduction and 0° to 135° external rotation. In an engaging lesion, the long axis of the humeral head defect is oriented parallel to the anterior glenoid rim, and thus engages with it when the shoulder is in abduction and external rotation. When the humeral defect is not parallel with the rim of the glenoid and thus does not engage with it in a position of function, the lesion is referred to as a non-engaging Hill-Sachs lesion . Anteroinferior glenoid bone loss may ultimately become large enough to create a glenoid with the appearance of an inverted pear ; this presentation is associated with recurrent anterior shoulder instability. 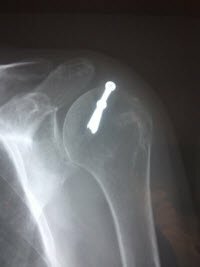 Optimal management requires close evaluation because significant bone loss in the shoulder (ie, greater than 5-6 mm on the glenoid side in the presence of a Hill-Sachs defect) is frequently a bipolar phenomenon that results in failure of surgery aimed at correction of the soft tissue defects alone. The ease of shoulder dislocation, number of dislocation events, and arm position all provide information on the stability of the shoulder. Shoulders that dislocate easily with activities of daily living, and those that dislocate in lower arm abduction angles, are more likely to have bone loss, both on the anterior glenoid and humeral head. The patient with glenoid bone loss or an engaging Hill-Sachs defect may describe a sensation of catching as the humeral head falls outside the glenoid track during arm movement. He or she may actually describe that “the shoulder falls out” when leaning forward during activities. These scenarios suggest bone loss, and when corroborated with physical examination, may lead the examiner to order advanced imaging of the shoulder. Examination of the shoulder begins with inspection. The overall posture of the patient should be noted (ie, sitting up straight or slouching forward), as well as the attitude of the shoulder and whether the shoulder and upper arm are held in a position of protraction or retraction. Fullness in the anterior shoulder may represent an anterior dislocation, while an arm fixed in internal rotation may represent a locked posterior dislocation. The musculature should be inspected for atrophy, specifically the deltoid and supraspinatus fossa. Assessment can be made for generalized ligamentous laxity. The shoulder should be palpated and any tender spots noted. Tenderness over the acromioclavicular joint may indicate acromioclavicular separation, and coracoid process tenderness may indicate tightness of the pectoralis minor and shoulder protraction. Both active and passive range of motion should be determined. During passive range of motion, care should be taken to observe any apprehension by the patient, especially as the arm approaches the position of abduction and external rotation. The examiner places one hand on the patient’s shoulder to stabilize the scapula, while grasping the patient’s forearm with the other hand. Beginning with the patient’s arm adducted to the side, the arm is externally rotated while bringing the patient’s arm into increasing abduction angles. With an unstable shoulder, apprehension will be evident in the position of abduction and external rotation. Crepitus may be palpable in this position if the patient has a labral tear and anterior shoulder instability. Apprehension and instability at lower arm abduction angles is indicative of severe glenohumeral instability, and raises the suspicion of bone loss. The strength of the rotator cuff must be assessed, especially in patients over age 40. In this patient population, shoulder instability may result in subscapularis rupture or avulsion of the supraspinatus and infraspinatus. Proximal biceps lesions may also occur, producing positive biceps provocative maneuvers. The load and shift test can be performed either supine or sitting upright. If supine, the scapula is stabilized by the exam table; if sitting, the scapula is stabilized by the examiner’s hand. The humeral head is then translated across the glenohumeral joint. Humeral head translation may elicit crepitus and pain, indicative of a glenoid labral tear. The jerk test and posterior load and shift test evaluate for posterior glenohumeral instability. Instability can be further confirmed clinically by the Jobe’s apprehension and relocation tests. Several imaging studies can be useful in diagnosing glenohumeral instability with bone loss. Imaging always begins with a full series of shoulder radiographs, including an anteroposterior (AP) radiograph of the glenohumeral joint, a scapular Y or outlet view, and an axillary view. We also try to get a Bernageau view in all our instability patients, as recommended by Edwards, to evaluate for glenoid bone loss. Bone loss on the anterior-inferior glenoid can be seen on the AP and axillary projections as loss of the normal bony contour of the anterior glenoid. Bone loss on the posterolateral humeral head, as seen with a Hill-Sachs defect, can be visualized on an AP radiograph of the shoulder with the arm in internal rotation. Several other radiographs are useful in the evaluation of bone loss specifically. The West Point axillary view is very useful in evaluating glenoid bone loss, while the Stryker Notch view is specific in evaluating for Hill-Sachs defects . The Stryker Notch view is particularly useful because the internal rotation of the humeral head brings the posterolateral bone defect into view. Computed tomography (CT) scan is a superior imaging modality for evaluating bone loss. Three-dimensional CT, in particular, helps to quantify the size and location of bone defects on the humeral head and glenoid (Figure 1) . Digital subtraction of the humeral head allows for precise determination of bone loss on the glenoid . Figure 1. 3D CT scan of a Hill-Sachs defect, with computer generated ruler measuring the exact size of the lesion. Magnetic resonance imaging (MRI) and MRI arthrography can provide useful information on the presence of tears of the capsulolabral tissue. These images are invaluable in preoperative planning for surgical stabilization, as the decision can be made whether bone grafting of the defects will be necessary. Hill-Sachs defects that occupy less than 30% of the humeral head can be managed effectively with an arthroscopic remplissage; defects greater than 30% of the humeral head may require open bone grafting with humeral head allograft [17, 18]. Indications for surgery include shoulder instability with bone loss that causes pain and lack of function in patients who have failed appropriate conservative management (Figure 2). Contraindications to surgery include active infection and patients that are habitual dislocaters. Severe bone loss may be a relative contraindication to arthroscopic repair, as it may require an open bone grafting procedure. Figure 2. Decision-making algorithm for shoulder instability. This algorithm was developed by Dr. Michael O’Brien to assist in determining the best method to manage the Hill-Sachs defect. Remplissage is performed in patients with moderate to large Hill-Sachs defects associated with glenoid defects of less than 25%. Patients with larger glenoid defects may require conversion to an open bone grafting procedure, such as the Latarjet procedure. Surgery can be performed either in the beach-chair or lateral decubitus position. The authors prefer to perform the procedure with the patient under general anesthesia and in the lateral decubitus position on a beanbag, reclining 30° posterior. If the beach-chair position is utilized, the surgeon must be facile with the anterior inferior and posterior inferior portals to ensure adequate shift and repair of the inferior shoulder capsule. Examination under anesthesia is essential at the beginning of the case to allow the surgeon to evaluate for anterior, posterior, and inferior subluxation and compare the findings with the opposite side. This is paramount in identifying the direction of instability and the degree of instability at different arm positions. The pathology can be identified and a surgical plan can be made prior to skin incisions. The use of an arm suspensory device and 10 pounds of traction is standard. This provides distraction across the glenohumeral joint to assist with visualization, as well as equal access to the anterior and posterior compartments and rotator cuff. Traction can be removed so the arm can be taken through a full range of motion to determine if a Hill-Sachs lesion is engaging or non-engaging. The biceps anchor and superior labrum should be probed to evaluate for a superior labrum anterior-posterior (SLAP) tear. Placing the probe over top of the biceps tendon can pull the tendon into the joint, allowing for inspection of the upper portion of the tendon that lies in the bicipital groove. This will also assess for any subluxation of the biceps out of the groove. The subscapularis is assessed for tears, with a 70-degree arthroscope utilized if there are concerns about partial tearing. The supraspinatus and infraspinatus are also inspected from the posterior portal to assess for partial- or full-thickness tears. 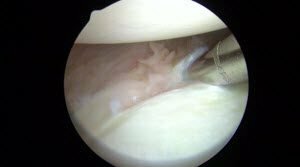 The anterior glenoid labrum is closely inspected for the presence of a Bankart tear. The labrum can be probed to evaluate for instability. Each glenohumeral ligament – superior, middle, and inferior – can be inspected directly. The arthroscope is driven into the axillary pouch to check for the presence of loose bodies. The capsule is inspected for any tearing off the humerus. This allows a HAGL to be diagnosed and addressed accordingly. The Hill-Sachs defect is assessed to determine the size, and if the lesion is engaging or non-engaging. With the arthroscope in the posterior portal, the arm is taken out of traction and brought into the athletic position of abduction and external rotation. In the presence of a large Hill-Sachs lesion, the defect will engage the anterior glenoid rim and the humeral head will fall off the track of the glenoid, subluxating anteriorly. This dynamic assessment will confirm the presence of an engaging lesion, which must be addressed at the time of surgery for a successful outcome. The presence of glenoid bone loss can be assessed with use of a graduated probe placed across the face of the glenoid from the posterior portal. The length from the anterior rim to the bare area is measured and compared with the length from the posterior rim to the bare area. The amount of glenoid bone loss, if present, can be determined. If significant anterior glenoid bone loss is present, the decision may be made to proceed with a bone grafting procedure. The Hill-Sachs defect can again be visualized from the anterior-superior portal. The assessment to determine the presence of an engaging lesion can be performed while viewing from the posterior portal or the anterior-superior portal, depending on surgeon preference. Figure 3. Superior view of a shaver inside the Bankart lesion in preparation for repair (left). View of a moderate-sized Hill-Sachs defect (right). After completion of the diagnostic arthroscopy and identification of all pathology, the repair can be performed. The case begins with preparation of the glenoid labrum. With the arthroscope in the anterior-superior portal, an arthroscopic elevator is introduced through the anterior-inferior portal to release the torn labrum from the medial glenoid neck. The labrum is elevated away from the bony attachment throughout the tear, down to and past the 6 o’clock position. The authors feel very strongly that in most cases, the inferior dissection should be continued to the area just inferior to the posterior inferior glenohumeral ligament attachment on the posterior glenoid. It is important to elevate the labrum until muscle fibers of the subscapularis are visualized, completely mobilizing the labrum for repair. A motorized shaver is then introduced to remove all fibrous debris between the labrum and the bony glenoid. The hood of the shaver is placed against the labrum, protecting it from iatrogenic damage. The shaver is also used to prepare the medial glenoid neck and anterior glenoid rim. The bony surface is roughened prior to repair to facilitate healing of the labrum. The first glenoid anchor is placed prior to addressing the Hill-Sachs defect. This facilitates reaching the inferior aspect of the glenoid. If the Hill-Sachs defect is addressed first and a remplissage is then performed, the space inside the glenohumeral joint is reduced; reaching the inferior glenoid for anchor placement would be challenging. The first glenoid anchor is placed, typically at the 5:30 to 6 o’clock position (Figure 4). Double-loaded suture anchors are utilized for the labral repair. The anterior-inferior cannula can be used to lever the subscapularis down to routinely reach this inferior position, or an inferior posterior-lateral portal may be utilized. Alternatively, the anchor drill guide can be placed trans-tendon through the subscapularis to reach the 5:30 to 6 o’clock position. A percutaneous suture passer is used to pass both sutures in vertical mattress fashion. The first suture is placed at the 6:30-7:00 position posterior-inferiorly, and the second suture placed at the 5:30- 6:00 position. Both sets of sutures are subsequently tied. This repairs the anterior-inferior labrum back to the glenoid rim, while also starting an anterior-superior capsular shift. One should note complete reconstitution of a PIGHL at this point. Figure 4. View of sutures from the most inferior (6 o’clock) anchor being passed through the posterior labrum. Next the Hill-Sachs defect is prepared. The arthroscope remains in the anterior-superior portal, and a motorized shaver is placed through the posterior portal. The shaver is used to prepare the base of the Hill-Sachs defect, removing all fibrous tissue from the base of the defect until bleeding bone is encountered. A micro-fracture awl may also be used to freshen the bed and assist with healing. An arthroscopic remplissage is then performed to transfer the posterior capsule and infraspinatus tendon into the Hill-Sachs defect. The defect represents a compression fracture; therefore, the bone is usually very hard. This necessitates over-tapping to prevent anchor fracture. The anchors can either be placed directly through the posterior cannula, or placed percutaneous through an accessory posterolateral portal. Next, the posterior cannula is slightly backed out into the subacromial space so that the tip of the cannula lies just outside the posterior capsule and infraspinatus tendon. A percutaneous suture passer is used to retrieve the sutures through the posterior capsule and infraspinatus tendon. Typically, two mattress sutures will be placed for each anchor. A sliding knot is used for each suture, and the sutures are tied blindly in the subacromial space (Figure 5b). Tying the sutures will transfer the posterior capsule and infraspinatus tendon into the Hill-Sachs defect, converting the Hill-Sachs defect into a non-engaging lesion. The remplissage is performed at this portion of the procedure, prior to completing the Bankart repair. Completion of the Bankart repair prior to addressing the Hill-Sachs defect would tighten the glenohumeral joint and translate the humeral head posteriorly, making visualization of the Hill-Sachs defect difficult. Figure 5. Superior view of the Hill-Sachs defect after anchor placement and suture passage (Figure 5a, left). Superior view of the Hill-Sachs defect after tying of the first mattress suture (Figure 5b, right). Finally, the Bankart labral repair is completed. A double-loaded suture anchor is placed at the 3 o’clock position. Vertical/horizontal mattress sutures are placed at 4 o’clock and 3 o’clock and tied. A third double-loaded anchor is placed at the 1 o’clock position. 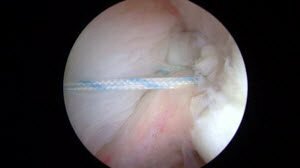 Vertical/horizontal mattress sutures are placed through the middle glenohumeral ligament and the superior glenohumeral ligament to complete the repair, giving a total of six sets of mattress sutures through the anterior and inferior capsule. 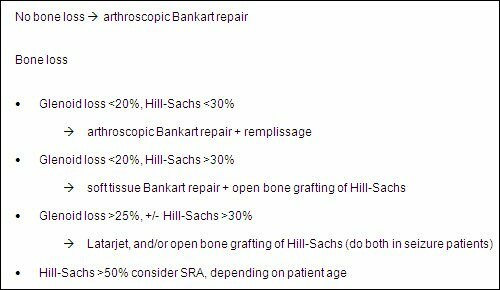 For large Hill-Sachs defects occupying greater than 30% of the humeral head articular surface, an open bone grafting procedure may be necessary [17,18]. This procedure may be performed in the beach-chair position through an anterior approach utilizing the deltopectoral interval. It may also be performed in the lateral decubitus position via a split between the middle and posterior deltoid muscles. In the anterior deltopectoral approach, a subscapularis tenotomy is used to gain access to the glenohumeral joint. By bringing the arm into extreme external rotation, the Hill-Sachs defect is visualized. The base of the defect is prepared, either with a small curette to decorticate the bony bed or with a small sagittal saw to make fresh bone cuts. The defect is measured with a ruler, determining both the anterior-posterior and medial-lateral dimensions. On the back table, a fresh-frozen allograft humeral head is selected. Utilizing the posterolateral aspect of the humeral head corresponding with the same location of the Hill-Sachs defect, the dimensions of the native lesion are marked on the allograft. A sagittal saw is used to make the bone cuts, producing a wedge of allograft bone to fill the defect in the native humeral head. The bone graft is then placed into the patient’s shoulder, filling the humeral head defect. The bone graft may require fine contouring to match the fit of the native humeral head. The bone graft is secured into position with two cannulated headless compression screws (Figure 6). Care should be taken to sink the headless screws 2 mm below the articular surface to avoid contact with the glenoid. The shoulder is reduced and taken through a full range of motion to ensure smooth rotation with no crepitus or grinding. The subscapularis tenotomy is repaired and the deltopectoral interval is closed. In the posterior deltoid split approach, the arm is left in traction. The interval between the posterior and lateral deltoid is split, allowing direct visualization of the infraspinatus. The raphe between the upper and lower infraspinatus us is split, allowing direct visualization of the humeral head defect. The defect is sized and the allograft placed and the infraspinatus closed. The arthroscopic Bankart repair can then be performed. Figure 6. Radiographic view of the bone graft in place and stabilized by two screws. In the postoperative period, an abduction sling is utilized for 4 weeks. Patients are allowed to remove the sling to shower, dress, and perform elbow range of motion exercises. Patients are encouraged to begin posture training and scapular retraction exercises. At 4 weeks, the abduction sling is discontinued. Formal physical therapy is initiated for passive and active-assisted range of motion. Rotator cuff and periscapular strengthening is initiated at 12 weeks. Full return to sport is allowed at 5 months postoperative. Remplissage, French for filling, is an arthroscopic technique used to fill a Hill-Sachs defect with local capsulotendinous soft tissue. 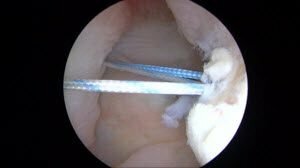 It is a modification of the Connolly procedure , originally described as an open procedure transferring the infraspinatus tendon and a small portion of the greater tuberosity into the humeral head defect. In 2008, Eugene Wolf  described an arthroscopic modification, performing a posterior capsulodesis and infraspinatus tenodesis with fixation of the tissue to the surface of the Hill-Sachs defect. This successfully fills the humeral defect by converting it from an engaging, intra-articular defect into extra-articular lesions. The goal is to prevent engagement of the lesion with the anterior glenoid. In 2009, the technique was modified by Koo et al , who described a double-pulley suture technique in which two anchors were used to insert the infraspinatus tendon into the entire Hill-Sachs defect. This modification created a broader footprint of fixation, and tying the sutures over rather than through the infraspinatus tendon allowed for a more anatomic and tissue-preserving approach. Additionally, this approach has none of the risks and morbidity associated with open bone grafting procedures. In 2008, Deutsch and Kroll  described a case of significant postoperative loss of external rotation following remplissage. Motion was improved following arthroscopic release of the infraspinatus tenodesis. The authors proposed that the infraspinatus tendon and posterior capsular tissue created a mechanical block to motion, limiting external rotation. Limitations to motion have been corroborated by other studies, yet the clinical significance is unknown. Elkinson et al  evaluated shoulder stability and range of motion following remplissage in a cadaveric model. The addition of remplissage to Bankart repair resulted in a statistically significant reduction in shoulder internal-external range of motion in adduction (15.1°), but not in abduction (7.7°). Remplissage provided little additional benefit in specimens with a 15% Hill-Sachs defect, but was effective in preventing engagement and recurrent instability in specimens with a 30% Hill-Sachs defect. Giles et al  compared remplissage to humeral head allograft and partial resurfacing arthroplasty in cadaveric specimens with 30% and 45% Hill-Sachs defects. Remplissage effectively prevented engagement in all specimens, but caused a greater reduction in range of motion compared with allograft reconstruction and resurfacing arthroplasty. All remplissage techniques enhanced shoulder stability, but restricted range of motion and increased joint stiffness. Medial suture placement resulted in the greatest joint stiffness. Stiffness observed in a cadaveric model may be more severe than that observed clinically. Boileau et al  noted a loss of external rotation of 8° in adduction and 9° in abduction compared with the contralateral side in 47 patients after Bankart repair with remplissage. Ninety-eight percent of patients had a stable shoulder, 90% were able to return to playing sports post-operatively, and 68% returned to the previously level of sport, including overhead athletes. Park et al  found no subjective complaints of decreased range of motion in 20 patients after Bankart repair with remplissage. Three patients (15%) reported a subsequent instability episode, but none required additional surgery. Nourissat et al  also found no significant statistical difference in range of motion between arthroscopic Bankart repair alone versus Bankart repair plus remplissage at 2-year follow-up, with a difference in external rotation at the side of 4° and in abduction of 3°. Several options are available to treat large Hill-Sachs defects in patients with recurrent shoulder instability. Arthroscopic remplissage is a safe, effective technique for the management of bone loss on the humeral head. Postoperative reductions in external rotation may occur, but these differences may not be clinically significant. It is paramount for the orthopaedic surgeon to recognize engaging Hill-Sachs defects and treat them accordingly. Failure to recognize bone loss at the time of operative stabilization may result in failure of soft-tissue reconstruction surgery. Felix H. Savoie III, MD, and Michael O’Brien, MD, are from Tulane University, New Orleans, Louisiana. Hill HA, Sachs MD. The grooved defect of the humeral head: A frequently unrecognized complication of dislocations of the shoulder joint. Radiology 1940; 35:690-700. Calandra JJ, Baker CL, Uribe J. The incidence of Hill-Sachs lesions in initial anterior shoulder dislocations. Arthroscopy 1989; 5(4):254-57. Rowe CR, Patel D, Southmayd WW. The Bankart procedure: A long-term end-result study. J Bone Joint Surg Am 1978; 60(1):1-16. Saupe N, White LM, Bleakney R, et al. Acute traumatic posterior shoulder dislocation: MR findings. Radiology 2008; 248(1):185-93. Taylor DC, Arciero RA. Pathologic changes associated with shoulder dislocations: Arthroscopic and physical examination findings in first-time, traumatic anterior dislocations. Am J Sports Med 1997; 25(3):306-11. Burkhart SS, De Beer JF. Traumatic glenohumeral bone defects and their relationship to failure of arthroscopic Bankart repairs: Significance of the inverted-pear glenoid and the humeral engaging Hill-Sachs lesion. Arthroscopy 2000; 16(7):677-94. Balg F, Boileau P. The instability severity index score. A simple pre-operative score to select patients for arthroscopic or open shoulder stabilization. J Bone Joint Surg Br 2007; 89(11):1470-7. Provencher MT, Bhatia S, Ghodadra NS, et al. Recurrent shoulder instability: Current concepts for evaluation and management of glenoid bone loss. J Bone Joint Surg Am 2010; 92(supplement 2):133-51. Piasecki DP, Verma NN, Romeo AA, Levine WN, Bach BR Jr, Provencher MT. Glenoid bone deficiency in recurrent anterior shoulder instability: Diagnosis and management. J Am Acad Orthop Surg 2009; 17(8):482-93. Armitage MS, Faber KJ, Drosdowech DS, Litchfield RB, Athwal GS. Humeral head bone defects: Remplissage, allograft, and arthroplasty. Orthop Clin North Am 2010; 41(3):417-25. Palmer I, Widen A. The bone block method for recurrent dislocation of the shoulder joint. J Bone Joint Surg Br 1948; 30(1):53-8. Kim DS, Yoon YS, Yi CH. Prevalence comparison of accompanying lesions between primary and recurrent anterior dislocation in the shoulder. Am J Sports Med 2010; 38(10):2071-76. Hall RH, Isaac F, Booth CR. Dislocations of the shoulder with special reference to accompanying small fractures. J Bone Joint Surg Am 1959; 41(3):489-94. Miniaci A, Gish M. Management of anterior glenohumeral instability associated with large Hill-Sachs defects. Techniques in Shoulder & Elbow Surgery 2004; 5(3):170-75. Griffith JF, Yung PS, Antonio GE, Tsang PH, Ahuja AT, Chan KM. CT compared with arthroscopy in quantifying glenoid bone loss. AJR Am J Roentgenol 2007; 189(6):1490-93. Flatow EL, Warner JI. 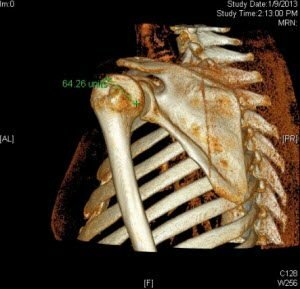 Instability of the shoulder: Complex problems and failed repairs. Part I: Relevant biomechanics, multidirectional instability, and severe glenoid loss. Instr Course Lect 1998; 47:97-112. Miniaci A, Gish M. Management of anterior glenohumeral instability associated with large Hill-Sachs defects. Tech Shoulder Elbow Surg 2004; 5:170-75. Chen AL, Hunt SA, Hawkins RJ, Zuckerman JD. Management of bone loss associated with recurrent anterior glenohumeral instability. Am J Sports Med 2005; 33(6):912-25. Connolly JF. Humeral head defects associated with shoulder dislocation: Their diagnostic and surgical significance. Instr Course Lect 1972; 21:42-54. Purchase RJ, Wolf EM, Hobgood ER, Pollock ME, Smalley CC. Hill-Sachs “remplissage”: an arthroscopic solution for the engaging Hill-Sachs lesion. 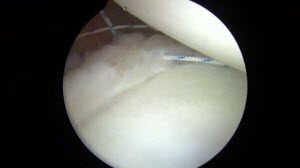 Arthroscopy 2008; 24(6):723-6. Koo SS, Burkhart SS, Ochoa E. Arthroscopic double-pulley remplissage technique for engaging Hill-Sachs lesions in anterior shoulder instability repairs. Arthroscopy 2009; 25(11):1343-48. Deutsch AA, Kroll DG. Decreased range of motion following arthroscopic remplissage. Orthopaedics 2008; 31(5):492. Elkinson I, Giles JW, Faber KJ, Boons HW, Ferreira LM, Johnson JA, Athwal GS. The effect of the remplissage procedure on shoulder stability and range of motion: an in vitro biomechanical assessment. J Bone Joint Surg Am 2012; 94(11):1003-12. Giles JW, Elkinson I, Ferreira LM, Faber KJ, Boons H, Litchfield R, Johnson JA, Athwal GS. Moderate to large engaging Hill-Sachs defects: an in vitro biomechanical comparison of the remplissage procedure, allograft humeral head reconstruction, and partial resurfacing arthroplasty. J Shoulder Elbow Surg 2012; 21(9):1145-51. Elkinson I, Giles JW, Boons HW, Faber KJ, Ferreira LM, Johnson JA, Athwal GS. The shoulder remplissage procedure for Hill-Sachs defects: does technique matter? J Shoulder Elbow Surg 2012 Oct 26. Pii:S1058-2746(12)00361-8. Doi: 10.1016/j.jse.2012.08.015. Boileau P, O’Shea K, Vargas P, Pinedo M, Old J, Zumstein M. Anatomical and functional results after arthroscopic Hill-Sachs remplissage. J Bone Joint Surg Am 2012; 94(7):618-26. Park MJ, Tjoumakaris FP, Garcia G, Patel A, Kelly JD 4th. Arthroscopic remplissage with Bankart repair for the treatment of glenohumeral instability with Hill-Sachs defects. Arthroscopy 2011; 27(9):1187-94. Nourissat G, Kilinc AS, Werther JR, Doursounian L. A prospective, comparative, radiological, and clinical study of the influence of the “remplissage” procedure on shoulder range of motion after stabilization by arthroscopic Bankart repair. Am J Sports Med 2011; 39(10):2147-52. Previous articleIs There Still a Role for Tibial Osteotomy in Knee OA?